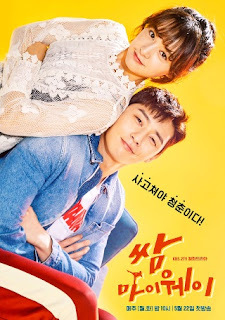 Fight For My Way (Hangul: 쌈 마이웨이; RR: Ssam Maiwei) is a South Korean television series starring Park Seo-joon and Kim Ji-won, with Ahn Jae-hong and Song Ha-yoon. It premiered on May 22, 2017 every Tuesday and Wednesday at 22:00 (KST) on KBS2. Plot: Follow the story about young adults with third-rate specs just struggling to survive, and the blossoming romance between two immature friends Ko Dong-man (Park Seo-joon) and Choi Ae-ra (Kim Ji-won) whose childish dynamic hasn't changed despite reaching adulthood.